Our various rental apartments all over the city of Frankfurt are ready for you to move in! We at City-Living offer you the best services in apartment rentals. 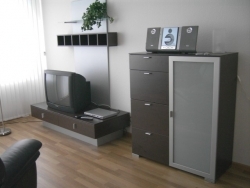 We specialize in commission-free rental of furnished apartments in Frankfurt/Main. Our fully equipped and comfortably furnished flats are located in Frankfurt´s most popular districts like the Nordend, the Westend, downtown and in Bornheim. These apartments are centrally located and have very good transportation connections. If you are looking for a short-term stay, our one-, two- and three-room Frankfurt rental apartments offer you independent and comfortable living in Frankfurt. You think you will not get luxury by staying in a flat as compared to that of a hotel. You are wrong! Our apartments are luxurious and spacious. They make you feel homely and royal at the same time. You will not miss a thing here. Our furnished apartments are well equipped. They include a fitted kitchen with a complete set of tableware, microwave, toaster, coffee maker, washing machine, DVD, TV, HiFi etc. Bedclothes and towels are also a part of our furnished accommodation package. The Nordend Residence at Bornheimer Landstrasse is one of the most desirable residential areas in Frankfurt. The Westend Residence is located directly at Grüneburg Park. This district is famous for its corporate look. It houses most of the important offices. The Bornheim residence is located at Freiligrathstraße and therefore is located in a very popular residential location in Frankfurt. The downtown residence offers you exclusive one-, two- and three-room apartments in the centre of the city. Our website apartment-2-rent.com offers details of short-term flats as well. Our short-term flats are located in a highly reputed residential area in Frankfurt - Westend. The vicinity of nearby parks, historical monuments and the innovative architecture of well-known banks add to the apartment´s beauty. The city is popular for its history and internationalism. The exclusive and modern furnished apartment is located at Grüneburgpark. This flat is fully furnished and has its own extensive balcony. The kitchen provides highly modern and state of the art technical equipment. A stylish bathroom, large windows with electrical exterior Venetian blinds enhance the quality of the flat. Our accommodations are a stylish and elegant alternative to a hotel room. 1,5 - 2 room flats around 50 square metres are available for monthly rental. We assure you of comfort and luxury. We can help by offering the best apartment with the much-needed facilities at an affordable price.